Do you know which pop star had the title chieftain of the Helmsdale Highland Games bestowed upon him in 2010? Well is was the lead singer of eighties Glaswegian pop band Orange Juice, it came several years after his grandfather had received the same. “I had to wear the full Highland kit, the kilt and the sporran although I wasn’t too sure about the sporran,” recalled Edwyn Collins. Of their nine UK hit singles, by far their best known song was the top 10 hit Rip It Up and that’s what we’ll explore this week. 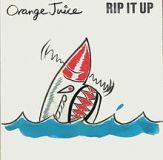 Orange Juice were originally formed by Glasgow-born singer Collins in 1976 and originally called The Nu-Sonics which was taken from a cheap guitar brand, guitarist James Kirk and drummer Stephen Daly were both members of the Machetes and joined Collins a few months later when they signed a deal with Postcard records which was owned by Alan Horne. Aztec Camera, the Go-Betweens and Josef K were also signed to the label and the label became known as ‘The Sound of Young Scotland.’ The line-up was completed when former Go-Between Dave McClymont joined and they changed their name to Orange Juice in 1979. By 1985 the band had split and Collins was thinking about a solo career, he hired a new manager, Grace Maxwell who later became his wife. He released two solo singles in 1987 which were produced by Robin Guthrie of the Cocteau Twins, but failed to impress the public. In the mid-nineties Collins built his own recording studio and recorded the album Gorgeous George. In 1994 he had the biggest song of his life when he released the Expressly EP with the lead track being A Girl Like You. The track, which samples the drum track from Len Barry’s 1965 hit 1-2-3, was the closest thing to a Northern Soul sound in years and was featured in comedy-drama film Empire Records. As an EP track is failed to make the top but in June 1995 it was re-issued as a single and reached number four. In 2009, he recorded a number of interviews on various radio stations including one with Jeff Lloyd on Absolute Radio which was filmed and you could see the change in Collins. His hair was thinning and his speech was slow but was in good spirits and was looking forward to returning to music. He did so in 2010 with the released of Losing Sleep which was produced by Sebastian Lewsley who explained in an interview how the recording process went, “We did each song in a day and a day consists of about four hours. So there’s a real expediency about how it’s recorded. The whole attitude of the album is just doing that. Not indulging anyone. Not having any band sitting round for days and days. Everyone involved looked quite petrified but they did it. So many have recognised his bravery, in 2009 he received the Ivor’s Inspiration Award in recognition of his struggle after the brain haemorrhage and the following year received an honorary Master’s Degree from the Buckinghamshire New University, in recognition of his ‘strong influences and contribution to the national and international music industry over the last three decades’.